May 20, 2007 - I occasionally think about putting together a walk through my history of portable computing. But life keeps getting in the way, just look at the time between this and my previous entry. This isn't that walk through, but just a quick peek. What's interesting is that the this-is-really-neat-new-gizmo feeling I get about the Blackberry, I also had for the IBM Portable back some 20 years ago. Hey, now I can take work home with me and when I travel with the family, I can connect and continue working. DOS, WordStar, and text editing Fortran on an IBM/370: life is good. 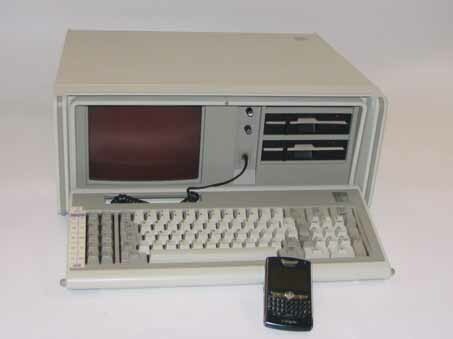 Before I settled on the Blackberry 8800, I auditioned a Treo 680 and a Blackberry Pearl. I really liked the Treo, but connecting it to the MS Exchange work just wasn't going to happen. I even liked it after one of those customer-service go -nowhere episodes when I hit the wrong key on initial startup and went into a Spanish language interface. Nothing like listening to the support rep surfing the web for an answer. The Pearl was good, too, until I had to do some amount of text entry. Since my last entry, I spent time with some good people at CollabNet, where I headed development of the CollabNet Enterprise Edition product. Founder Brian Behlendorf and the company are a chapter in Thomas Friedman's The World is Flat. I had a chance to experience the OpenSource culture and visited the city of Chennai in India. During my visit there, my traveling companions and I were treated to a visit to Mahabalipurum. Cruising Chennai at night in an autorickshaw was a kaleidoscope of all the senses. "Information is money. Lots of information is lots of money. Add quick, cheap processing and you get a key piece of infrastructure for the networked economy." Digital Impact was a public company and at the time Acxiom, also a public company, acquired it. This past week, Acxiom announced that it was being acquired and taken private.